#AskAlan: Who is Rory McIlroy’s closest historical counterpart, and will Tiger and Phil pair up in Paris? The post-Augusta doldrums are officially over — the three-week run of Colonial-Muirfield-Shinnecock is as good as it gets. Bring it…I’m ready. Yes, you're wrong – that was a rock star performance by Justin Rose. Of course, he has been methodically compiling his Hall of Fame credentials over the last decade plus, and I think he’s now there. But I agree that Koepka’s performance was quite impressive; dating to Sunday at the Players, he has fired three 63s in his last five rounds. Not only does Koepka's fine play add some juice to the upcoming majors, but it's a major boost for the U.S. Ryder Cup team. Koepka was a stud last time around and the Americans can once again count on him to be a rock. Umm, because arguably Europe's two best players (Rose and Rahm) were plying their trade in Texas? Or maybe because, despite the glut of World Ranking points, only six Americans bothered to make the trip? (Harold Varner III, take a bow.) There is also the general insecurity Euros have felt ever since the 1920s, when Americans began dominating the game they invented. This chip-on-the-shoulder can be a beautiful thing: it birthed Seve and that greatest generation and reinvented the Ryder Cup. But like a clingy ex, the whole shtick can indeed get a little old. It's been surprisingly tame on my Twitter feed compared to earlier in the season, when the Euro fanboys would crawl out from under their bridges with every top-5 by one of their brethren. I think they've been dispirited by the simple fact that U.S. players presently hold all four major championships and the Players trophy. But I have no doubt they’ll rear their ugly heads soon enough. Spieth is great TV because between the ropes he's such an extrovert. Not everyone loves to hear him barking at his ball or constantly opining to Greller, but it is undeniably more interesting than watching an emotionless automaton like, oh, half the Tour. Also, he’s a Texas boy competing in Texas, gearing up for a summer during which he'll try to complete the Grand Slam. There is also something heroic in his struggle. No one fights harder for every stroke, and watching Spieth labor to piece together his game is fascinating. After his fine work navigating claustrophobic Colonial he's now second on Tour in strokes gained tee-to-green…and a woeful 192nd in strokes gained putting. A lot of attention has been given to his short misses but statistically he's about the same as last year. Truth be told, he's never been great on short putts — even during his epic 2015 season he was a ho-hum 52nd on putts inside 10'. This year he's regressed to 154th, after ranking 102nd in 2017. The bigger fall-off has been from mid-range, where Speith was historically great. In 2015 he ranked second from 15’-20’ and first 20’-25’. (Last year he was 65th and 4th, respectively.) These are the bonus putts you don’t statistically expect to make and Spieth used to pour them in like practice round gimmes, one of the keys to his low scores. This year he’s 200th from 15'-20' and 187th from 20’-25’. He’s also wrecking rounds with three-putts, having three-jacked 30 times this year when it happened only 28 time all of last season (and 38 times in '15). All-time great putters like Ben Crenshaw and Brad Faxon and Tiger Woods had that gift early in their golfing lives and it never left. 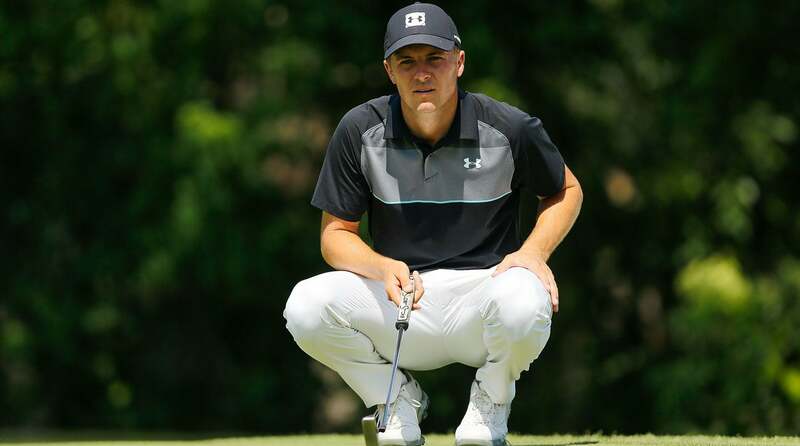 The interesting thing about Spieth is the he describes himself as a poor putter throughout amateur golf and says it wasn’t until college and the outset of his pro career that he turned the flatstick into a weapon through mechanical changes, hard work and, most of all, belief. He's still working hard but clearly struggling with his mechanics. Belief is even more mercurial. As electric as Spieth's final round was at the Masters, what lingers is him missing a do-or-die 8’ putt on the 72nd hole with the green jacket potentially hanging in the balance. (The blown 12-footer for eagle on 13 also stung.) I still believe this is a slump that will pass, and as good as Spieth's ball-striking is, once the putter heats up he will be very, very dangerous. But as the frustration and scar tissue builds up, it’s impossible not to wonder if a bad putter who willed himself into being great can revert to permanent mediocrity. Time will tell with Spieth. At least we know the cameras will always be watching. I could play either Trinity or Colonial every day for the rest of my life and be quite content, but it's worth noting that the pros torched both courses without breaking a sweat. Each one needs another 2,000 or so yards to test Tour players. Or they need to be baked-out to the point of almost being unplayable, which is risky business and not good for the members and paying customers who tee it up there as soon as the tournament leaves town. Modern technology and training methods have simply overwhelmed the game's playing fields. The more interesting question is, Will Tiger and Phil be paired together? I think it's a resounding yes. The Augusta practice round wasn't an accident; these guys are both way too calculating for that. They're getting a feel for each other's games and equipment and building more rapport and trust. Tiger and Phil paired together in fourballs? The earth will stop spinning on its axis, and I can't wait.